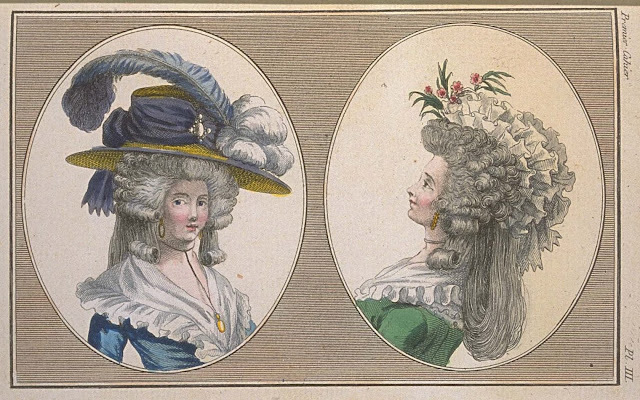 It presents two Women's Busts. The first is coiffed à l'Ingénue. A straw hat, whose edge is trimmed with a violet ribbon. The crown is high, à l'Anglaise, trimmed with violet gauze. A pearl pin on the front. A bow or cockade on the back, whose edges, about two or three inches long, are hanging. On the hat, on the left, is a tuft of four white plumes, surmounted by a large violet plume called the Follette. On the neck, a cord in the form of a necklace, at the end of which hangs a medallion. The earrings are large trembling rings. 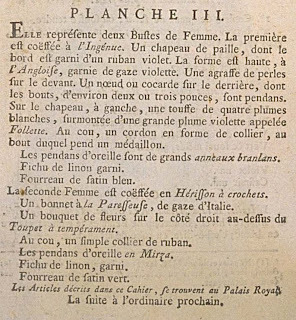 The second woman is coiffed en Hérisson with hooks. A cap à la Paresseuse, of Italian gauze. A bouquet of flowers on the right side on top of a Toupet à temperament. On the neck, a simple ribbon necklace. 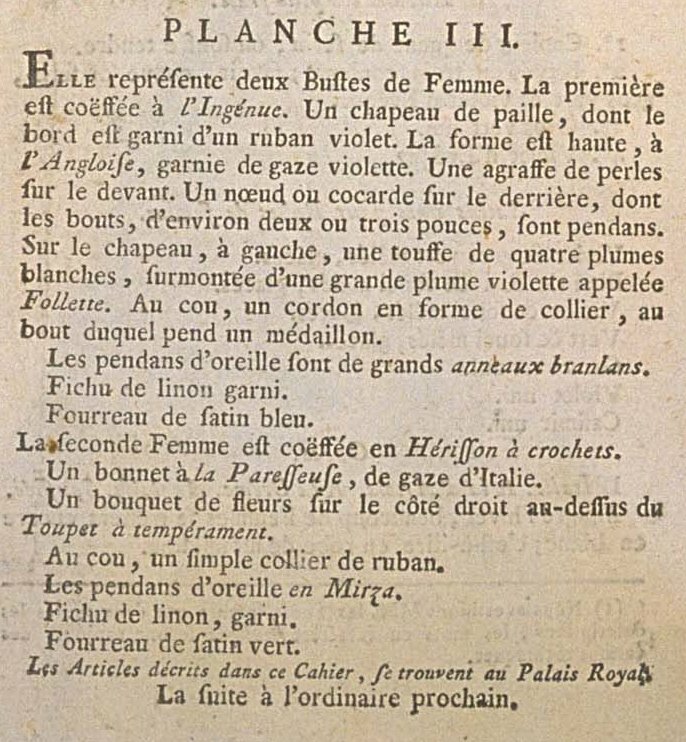 The Articles described in this Book were found at the Palais Royal. The earrings are fascinating. Wish we could find an extant pair. 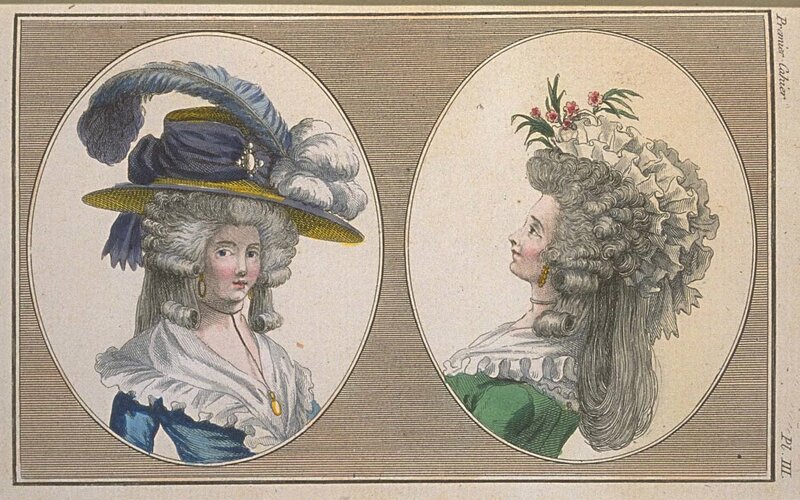 I believe I see them into the mid-1790s fashion plates. They are lovely and very present in the GdM plates as well! I wish I could find some extant ones, too.